Early this morning before leaving for work, David cut some flowers to take for displaying in his new office at school. Since moving into the school's new band room this summer, he has been working on adding personal touches to the space to make it feel more inviting. David puts together gorgeous bouquets effortlessly and seems to really have an eye for color. He inspired me to make my own bouquet this morning before heading off to work. This morning was quite a bit cooler than what we're used to this time of year and it almost felt like early fall. I lost myself in walking around the garden and collecting blooms for my bouquet. The sun was shining and the birds were singing and I think I could have stayed outside meandering in the garden all day long. It was truly one of those mornings that just makes you want to linger a little longer than you should. I proudly displayed my bright bouquet in the kitchen and I know I will enjoy the pop of color every time I enter the room. Who needs pricey store bought bouquets when nature provides so much beauty right outside your door? Love the colour combination. Very pretty. Oh so pretty. Love the old enamel pot too and in orange!!! Oh and love your new header. Love this post :) My Mum has that knack of putting a bunch of anything together and making it look beautiful, just lovely. So pretty. We just moved back to the U.S., so I can't wait to get our garden planted next spring. It's lovely & I love the pitcher/vase that you have it displayed in! Beautiful flowers and in the perfect container for them! I'm inspired to go pick some of my black eyed susans! Beautiful photography and sense of colour! It's amazing all that grows there! Love the orange rustic pitcher, such a perfect match with those gorgeous flowers. Tammy, your bouquet is lovely. The colors look pretty together too. Beautiful images, it was cool today here too. Enjoy the rest of your week! So beautiful! This is THE type of bouquet I crave all Summer long! 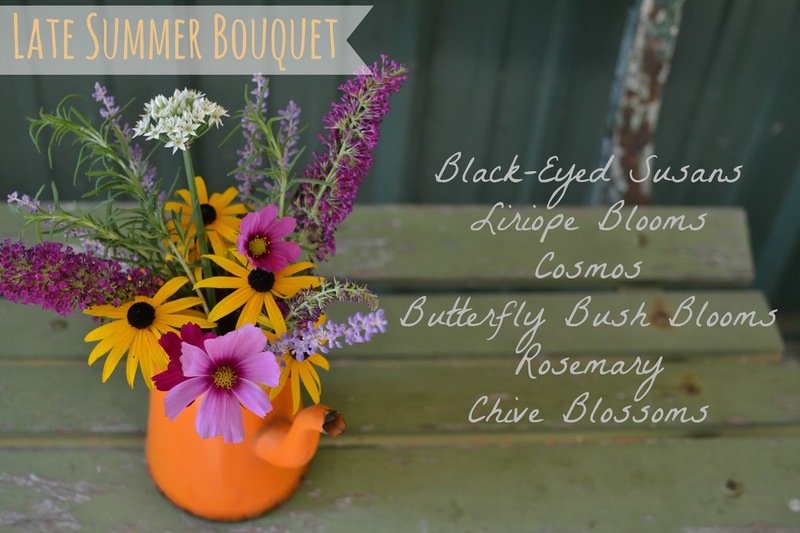 I love that Dave inspires YOU to make this lovely bouquet - that's pretty cool! Great bouquet and what a perfect pot to put them in! Really love it! I love freshly picked mixed flowers! You did a beautiful job! I also really like your new header! You are so right! :) Your bouquet is just beautiful. Enjoying home-picked flowers is the best. Our morning was cooler today as well. Today our high was 71 - completely unheard of for this time of the year. I'm enjoying the break from heat and humidity!! How fun to gather and make a bouquet out of your own flowers. The flowers are simply gorgeous! I love the tea kettle for a vase. That bouquet really looks fantastic in the orange coffepot! I have enjoyed fresh garden bouquets all summer. I will really miss them come the first frost. That turned out so nice...I love Black eyed Susans and Cosmos and the lavender in there. Great idea for the teapot vase...love the color! Have an awesome day!! Your bouquet is beautiful, and it looks perfect in that bright orange coffee pot. Your morning sounds like so much fun. I love to be outside in the early morning--it's my favorite time of day. What a gorgeous bouquet!! Your "vase" is a perfect showcase for all the beautiful flowers. I should have quite an impressive sunflower display in a few weeks. I am so excited for all the color! So beautiful! Love the old coffee pot as a vase! What a beautiful bouquet! Those bright yellow flowers would cheer me up any day. Nicely done! Love the coffee pot and the amazing colors. Tammy if I am ever in your neck of the woods I am going to come visit and learn some creative tips from you. I absolutely love your photos. This looks almost identical to the one I have in a mason jar on my kitchen table. But it will be my last as the perennial garden is pretty much petered out in our neck of the woods. I love those Fall, chilly early mornings out in my garden, sipping hot coffee and picking the last of the tomatoes and soaking up the morning sunshine. What a delicious bouquet - just lovely! oh that is a beautiful bouquet!! you know, it feels like fall here too...i like it but it's still summer, i want heat until it's really fall! although i know my boys appreciate this cooler weather for football practice! i actually have to put my hoodie on before it's over! So pretty what a lovely little display of flowers. Feeling the same here first thing in the Morning, An Autumn feel. Clever Hubby I must say. Making a bouquet is an art and some have an eye for it. I seem to never get it right. Love the flowers and pictures - Black eyed Susan's rock! And also just catching up and noticed your new header - LOVE it! What a pretty bouquet. I love flowers but rarely take the time to bring them indoors; I should do that more often. Loving this colourful bouquet! Better than the storebought ones for sure. That is quite the lovely boquet for sure. And yes it really has felt like fall in the mornings lately hasn't it?? I love it. what a beautiful flower bouquet.....love the colours. do not take me bad.i am copying one of ur pics from above....it's just too admirable.........and i wish i had them too.......so u greww them in ur backyard? Gorgeous bouquet! The orange container is also very pretty. that is really gorgeous! best kind of bouquet! !